Aim: To evaluate in vivo the remineralizing efficacy of silver diamine fluoride (SDF), glass ionomer Type VII (GC VII) and calcium hydroxide (Dycal). Materials and Methods: 60 subjects in the age group of 18-35 years, matching the inclusion criteria and having deep carious lesions in the permanent first and second molars were selected. The teeth were aseptically opened under rubber dam and after gross caries removal, approximately 0.4mg of soft discolored dentin was removed with a sharp spoon excavator from the mesial or distal aspect of the cavity. The test material was randomly selected and applied in a thickness of 1.5-2mm and the cavity sealed with cavit. The patients were followed up at regular intervals with radiographic evaluation at 12 weeks. At 3 months the temporary restoration was removed and dentin samples were collected from the other half of the cavity which was left in the first appointment. Atomic absorption spectrophotometry, Colorimetric test using UV-vis spectrometer and potentiometric titration were used for determining calcium, phosphorous and fluoride respectively. Results: Almost equivalent rise in the percentage of calcium level was seen in GC VII and Ca(OH) 2 groups, followed by SDF group. Highest percentage rise in phosphate ions was seen in GC VII group followed by SDF group and Ca(OH) 2 group. Highest percentage of fluoride rise was seen in GC VII group followed by SDF group and Ca(OH) 2 group. Conclusions: The results indicated that both GC VII and SDF can be potential indirect pulp capping materials. With encouraging results obtained in the first part of the study, a clinical study was planned with the purpose to evaluate the clinical efficacy and remineralization potential of two high fluoride releasing materials, i.e. glass ionomer Type VII (GC VII) and silver diamine fluoride (SDF) as indirect pulp capping materials and to compare it against Ca(OH) 2 in deep carious lesions. The research was approved by the Institutional Ethics Committee of the All India Institute of Medical Sciences. Sixty subjects of either gender in the age group of 18-35 years, having deep carious lesions in permanent first and second molars, were recruited if they confirmed with the inclusion and exclusion criteria. Informed written consent was taken. Patients with good state of general health and absence of any chronic systemic disease, presenting with a large (preferably only occlusal) carious lesion with abnormal sensitivity to hot and cold suggestive of reversible pulpitis were included in the study. Radiographic examination showed normal lamina dura and periodontal ligament space. Those with history of spontaneous or severe throbbing pain or tenderness on palpation/percussion were excluded. A study performa was designed which included demographic details, chief complaints and recording of all the subjective and objective symptoms, radiographic findings and the follow-up recordings. After rubber dam application, the tooth was opened aseptically using a cylindrical diamond bur in a high-speed hand piece. The cavity was enlarged sufficiently to expose the deep carious lesion for proper examination and sample collection. After penetrating the dentino-enamel junction, gross caries was removed using large, no. 4 round bur in a slow-speed hand piece. The last layer of soft, discolored dentin was removed with a sharp spoon excavator from the mesial or distal half of the cavity on a random basis and was noted on the patient record. This was weighed and approximately 0.4 mg of carious dentin was placed in a small glass vial for mineral evaluation. Subsequent to this, one of the test materials, 1.5-2 mm in thickness, was placed over the remaining discolored dentin and the cavity was sealed with Cavit. Selection of the test material to be placed was done by random selection basis. An envelope containing 60 chits was prepared with 20 each for three different test materials, and the patient was allowed to take one chit from the envelope. The material as per that chit was placed in the cavity. The patients were followed up at 1, 3, 6 and 12 weeks for any signs or symptoms of discomfort, pain or swelling clinically. At 12 weeks, radiographic evaluation was also done. At 3 months, the restoration was removed under rubber dam and the sample as described above was collected from the other half of the cavity which was left in the first appointment and submitted for evaluation of mineral content. For estimation of calcium, phosphate and fluoride ions, wet digestion method was used. As described in Part I of the study, estimation of calcium ion was done by atomic absorption spectrophotometery, phosphate by colorimetric analysis and fluoride by potentiometric titration analysis. The data were defined by two parameters, the mean and the percentage change in the mean. The variables obtained were analyzed by the parametric tests. One-way Analysis of Variance (ANOVA) was used to test for significance of differences between class means of all the groups. 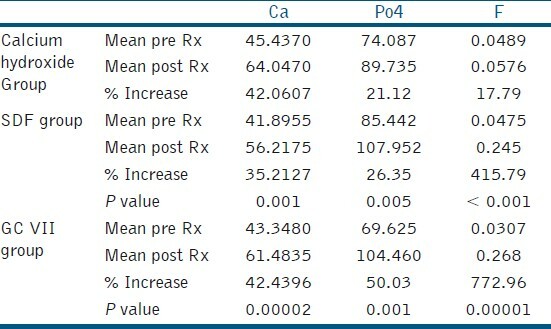 There was no statistically significant difference in the calcium, phosphate and fluoride levels of the three groups preoperatively [Table 1], which indicates the uniformity of the samples. In post-treatment samples, in Ca(OH) 2 group, increase in the calcium level was significant, but the increase in the phosphate and fluoride levels was not significant. In both GC VII and SDF groups, there was significant increase in the calcium, phosphorous and fluoride levels as seen from [Table 2]. Postoperative calcium level showed statistically significant difference in ions after application of Ca(OH) 2 , SDF and GC VII. But Ca(OH) 2 and GC VII exhibited more calcium deposition as compared to SDF. However, the increase was statistically not significant. Postoperative phosphate level showed statistically significant difference in SDF and GC VII groups but not in Ca(OH) 2 group. The increase in phosphate level was the highest in GC VII group. Postoperative fluoride level showed statistically significant difference in SDF and GC VII groups. GC VII exhibited higher fluoride deposition when compared to SDF, but the difference was not statistically significant, which is contrary to the findings of the ex vivo study. The Indirect Pulp Capping procedure is based on the theory that a zone of affected, demineralized dentin exists between the outer infected layer of dentin and the pulp. When the infected dentin is removed, the affected dentin can be remineralized and the odontoblasts can form reparative dentin, thus avoiding the pulp exposure. Physiologic remineralization is a dynamic process which requires viable collagen fibers and odontoblastic processes in the last layer of carious dentin. The sound collagen fibers function as a base on to which apatite crystals can attach. The living odontoblastic processes supply calcium phosphate from the vital pulp for physiologic remineralization. Various materials have been used for indirect pulp capping which include calcium hydroxide, zinc oxide eugenol, glass ionomer cement (GIC) and composite. Fluoride release from GIC is shown to inhibit demineralization and enhance remineralization of lesion close to restoration of surrounding dentin or enamel in vitro. Therefore, remineralization of carious dentin that is intentionally left on cavity floor is expected to be enhanced by fluoride release from GC, more so from type VII, which is a high fluoride releasing GIC. The level of fluoride release from Fuji VII is much higher than any other glass ionomer. Fuji VII releases approximately three times more fluoride than Fuji I and six times more than Fuji IX. , It is easier to apply and the setting time can be accelerated and moisture critical time is reduced. The utilization of SDF as a cariostatic agent is not novel. Recent reports of its effect in deciduous teeth follow classic studies which had reported its utility in the treatment and prevention of caries in these teeth. , It releases fluoride and helps in the deposition of silver phosphate to restore the mineral content, resulting in rehardening of the tooth structure. The fluoride released from silver diamine can penetrate better into dentin than into enamel due to greater amount of protein substrate, carbonates and phosphates in dentin for reaction. We evaluated SDF as an indirect pulp capping material in the present study for the first time. Yamaga et al. have reported its use in the treatment and prevention of caries in deciduous teeth. Llorda et al. documented its caries preventing efficacy in permanent first molars. In the present study, SDF increased calcium, phosphate and fluoride ions in caries affected dentin, the highest being fluoride ions. The calcium ions may have migrated from the pulpal blood as SDF does not leach out any calcium ions. The increase in calcium ion was lesser in SDF group than that seen in Ca(OH) 2 group. This further strengthened our hypothesis that increase in calcium ion in Ca(OH) 2 group could be ascribed to both from Ca(OH) 2 as well as from pulpal blood. As there was no calcium ion from SDF, the net increase was lesser than that in Ca(OH) 2 group. The increase in phosphate ions could be attributed to deposition of silver phosphate, as blackish discoloration beneath the site of application of SDF was seen at re-entry in majority of the cases. The increase in fluoride ion could be attributed to leaching of fluoride ions from silver diamine fluoride. Yamaga et al. attributed the increased hardness of dentin to deposition of silver phosphate in SDF. Russo et al., however, warned about possible pulpal injury associated with SDF. In the present study, two of the patients reported symptoms of irreversible pulpits after application of SDF. However, there could be an error in case selection, as clinical findings and histological picture do not always necessarily coincide. In the present study, GIC VII increased calcium, phosphate and fluoride ions in caries affected dentin. As described in SDF group, GIC VII also does not leach out any calcium ions; hence, the calcium ions may have migrated from the pulpal blood. The increase in calcium ion was equivalent to that seen in Ca(OH) 2 group. Also, there was a significant increase seen in phosphate ion concentrations. There was no plausible explanation for this increase. One reason might be the movement of phosphate ions through dentinal tubules along with calcium ions in the process of remineralization. GIC provides an excellent seal with dentin and thus provides a conducive environment for remineralization. There was also a significant increase in fluoride ion concentration after placement of GIC VII. This was expected as GIC is known to provide a "boost" of fluoride ions, thus helping in remineralization of dentin. The results of mineral content analysis in this study indicate that almost equivalent rise in the percentage of calcium ions was seen in GC VII and Ca(OH) 2 group, followed by SDF group. Highest percentage of rise in phosphate ions was seen in GC VII group followed by SDF and Ca(OH) 2 groups. Highest increase in fluoride ions was seen in GC VII, followed by SDF and Ca(OH) 2 groups. The results indicated that both GC VII and SDF can be used as potential substitutes to Ca(OH) 2 for indirect pulp capping. Further studies with larger sample size are required to validate the results and to recommend SDF and GC VII as standard indirect pulp capping materials. 1. Conrado CA. Remineralization of carious dentin. Braz. Dent J 2004;1:59-60. 2. Tomes J. A system of dental surgery. London: I. Churchill; 1859. 3. Wilson AD, Kent BE. A new transluscent cement for dentistry. The glass ionomer cement. Braz Dent J 1972;132:133-5. 4. Fusayama T, Okuse K, Hosoda H. Relationship between hardness, discoloration and microbial invasion in carious dentin. J Dent Res 1966;45:1033-46. 5. Fusayama T. Two layers of carious dentin: Diagnosis and treatment. Oper Dent 1979;4:63-70. 6. Estrela C, Sydney GB, Bammann LL, Junior OF. Mechanism of action of Calcium and Hydroxyl ions of Calcium hydroxide on tissues and bacteria. Braz Dent J 1995;6:85-90. 7. Burke FM, Ray NJ, McConnell RJ. Fluoride-Containing Restorative Materials. Int Den J 2006;56:33-43. 8. Ingle JI, Bakland LK. Endodontics.5 th ed. London: Elsiver Pub; 2002. p. 868. 9. Ingle JI, Bakland LK. Endodontics. 5 th ed. London: Elsiver Pub; 2002. p. 864-8. 10. Dhondt CL, De Maeyer EA, Verbeeck RM. Fluoride release from glass ionomer activated with fluoride solutions. J Dent Res 2001;80:1402-6. 11. The product Brouchere. Available from http://www.gcindiadental.com/images/documents/fuji7product.pdf [Last cited on 2010 sep 4]. 12. Sayed MM, Meyers I. Fluoride Release by Glass Ionomer Cements, Compomer and Giomer. Dent Res J 2009;6:75-81. 13. Yamaga R, Nishino M, Yoshida S, Yokomizo I. Diamine Silver Fluoride and its Clinical Application. J Osaka Univ Dent Sch 1972;12:1-20. 14. Russo M, Komatsu J, Takayama S, Holland Júnior C, Sundfeld RH, Mestrener SR, et al. Silver diamine fluoride. Pulp response to application of a 10% solution to dentin. RGO 1987;35:264-6. 15. Llodra JC, Rodriguez , Ferrer B, Menardia V, Ramos T, Morato M. Efficacy of Silver diamine fluoride for caries reduction in primary teeth and first permanent molars of Schoolchildren: 36-month Clinical Trial. J Dent Res 2005;84:721-4. Donovan, T.E. and Anderson, M. and Becker, W. and Cagna, D.R. and Hilton, T.J. and McKee, J.R. and Metz, J.E. Peng, J.J.-Y. and Botelho, M.G. and Matinlinna, J.P.